Fuzzbuquet is an all ages fantasy story about a monster with a very large heart and a very small brain. In the previous issue, we met Fuzzbuquet- a lovable beast with big dreams of becoming a cheese-maker. Unfortunately for Fuzzbuquet, no one would buy his fuzzy cheese. Desperate to fulfill his dreams, Fuzzbuquet decides to finance his business by setting out on a quest to slay a dragon. In this issue, Fuzzbuquet befriends a mischievous forest sprite that goes by the name of Soggi Biscotti. Having far from altruistic motives, Soggi tricks Fuzzbuquet into following her to the abandoned city of Cakehorn. Once in the city, the two find themselves in a fight for their lives against all manner of evil baked goods. 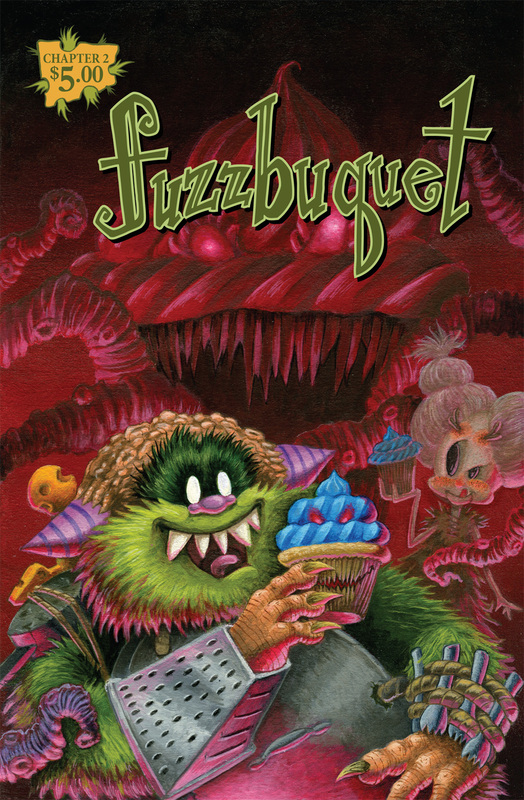 Pastry predators and sinister sweets abound in this second chapter of Fuzzbuquet!